HOUSTON � A preliminary review of Columbia's data recorder, known as the Orbiter Experiments Supports System (OEX,) indicates that potential data may exist as late as 14:00:18 GMT on February 1, 2003. 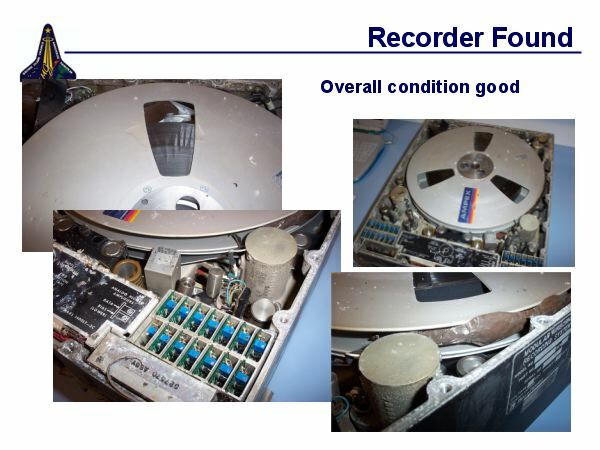 The recorder tape was duplicated at the Kennedy Space Center in Florida this week and will be reviewed at the Johnson Space Center in Houston and other facilities this weekend. No actual sensor data on that tape has been reviewed at this time, but a "time tag" viewed on the tape during its duplication confirms that some type of imprint exists until 14:00:18 GMT. After that time, the tape is blank. The process of reviewing any engineering data that may be contained on the tape is expected to be time consuming. But investigators hope that any useful data retrieved from the recorder can be baselined on the Columbia accident timeline as soon as possible. Search teams near Hemphill, Texas retrieved the data recorder on Wednesday, March 19. The teams focused their search for the recorder near Hemphill after an analysis of debris from Columbia indicated other material from the area in which the recorder was located on the orbiter had been found there. The recorder was cleaned at a lab in Minnesota and was sent to Kennedy Space Center for duplication earlier this week.